Chemistry: (Fe, Mg)2SiO4, Iron Magnesium Silicate. Uses: As refractory sands, abrasives, gemstones and as mineral specimens. Fayalite is named for the Island of Fayal of the Azores. It is one of two minerals that are simply known as olivine. The other mineral is forsterite. Fayalite is the iron rich member with a pure formula of Fe2SiO4. Forsterite is the magnesium rich member with a pure formula of Mg2SiO4. The two minerals form a series where the iron and magnesium are substitutable for each other without much effect on the crystal structure. Fayalite due to its iron content has a higher index of refraction, is heavier and has a darker color than forsterite. Otherwise they are difficult to distinguish and virtually all specimens of the two minerals contain both iron and magnesium. For simplicity sake and general public recognition, they are often treated as one mineral, olivine. Olivine, however is actually not officially recognized as a mineral. Olivine's gemstone variety is known as peridot. Most peridot is the magnesium rich forsterite, not fayalite. Fayalite's higher iron content makes for darker, less attractive specimens that are not generally used as gemstones. Fayalite forms a second series with the mineral tephroite. 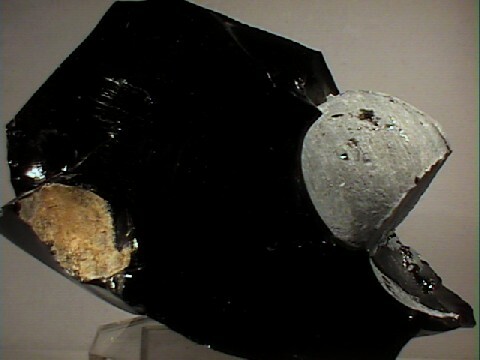 Tephroite is the manganese rich member of the series with a formula of Mn2SiO4 and fayalite is the iron rich member. Tephroite is a member of the more inclusive Olivine Group. Sometimes the Olivine Group is considered limited to just fayalite and forsterite, but most mineralogist include all silicate minerals with the same olivine structure, such as tephroite. Fayalite is found in ultramafic igneous rocks. Mafic is a word that is used to define igneous rocks with a high iron and magnesium content. The "MA" is for magnesium while the "F" is for ferrum, the latin word for iron. The olivine minerals have a high melting point and are the first minerals to crystallize from a mafic magma. Forsterite crystallizes first with fayalite crystallizing last when other minerals such as the pyroxenes are just beginning to form. The early crystallization of olivine is the reason that molten lavas can contain already crystallized grains of olivine. Some ultramafic rocks can be composed of almost all olivine and these are called dunites or peridotites. Olivine is also present in marbles that formed from metamorphosed impure limestones. Fayalite is also found in many iron-nickel meteorites, not just as small grains but as large crystals sometimes occupying over 50% of the meteorite's volume. Color is yellowish green to greenish brown to black (lighter greens indicate a higher magnesium content and would be considered olivine or even forsterite). Crystal System is orthorhombic; 2/m 2/m 2/m. Crystal Habits include flatten tabular to box shaped crystals, but good crystals are rare. More commonly found as grains in alluvial gravels and as granular pockets in highly magnesium and iron rich volcanic rock. Also massive. Cleavage is distinct in two directions at 90 degrees. Hardness is 6.5 - 7. Specific Gravity is approximately 4.3 (above average for non-metallic minerals). Other Characteristics: Index of refraction is 1.87, moderate double refraction can usually be seen and crystals are typically striated. Associated Minerals are diopside, spinel, plagioclase feldspars, chromite, anorthite, biotite, cristobalite, hornblende, serpentine, obsidian, iron-nickel meteorites and augite. Notable Occurrences include the Salt Lake Crater, Oahu, Hawaii; Sugarloaf Mountain, Inyo County, California and Peridot, Gila County, Arizona, USA; Lipari Islands, Sicili and Mt. Vesuvius, Italy; France; Sweden and many other locations. Best Field Indicators are environment of formation, color, crystal habit, hardness and density.